The ZX80 is widely regarded as having founded the British home computer market (although the 1977 MK14 might have the better claim in this regard). In many ways, it was a link between the hobbyist MK14 and the mass market ZX81 and Spectrum. It was available in two versions - a self-assembly kit and a ready-built computer, thus covering both the hobbyist and high street markets. 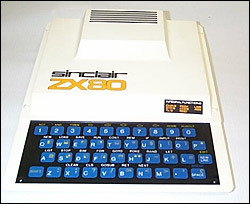 The ZX80 established the distinctive Sinclair look (unkindly compared to a block of cheese); it was the first implementation of Sinclair's legendary touch-sensitive keyboards; it also had the first implementation of Sinclair BASIC. By modern standards (or even those of the later Sinclair computers), it was a very primitive beast. An scathing Personal Computer World restrospective six years later highlighted the machine's "unusable keyboard and a quirky BASIC" which it claimed had "discouraged millions of people from ever buying another computer" (PCW, October 1985). This was surely far too harsh a verdict - before production ceased in August 1981, the ZX80 sold over 100,000 units, over 60% of them for export, making it a substantial commercial success for the company. The real significance of the ZX80 lay not in its relatively modest sales but in its innovative design and marketing. At the time, it was one of the smallest and cheapest home computers in the world. It was also one of the first aimed at the home user, as opposed to the hobbyist or professional. In 1979, computing was either very complex or very expensive or both. A 20Mb Winchester hard disk drive could cost over £2000, while memory cost £16 per kilobyte. With such high costs, serious computing was largely confined to business. Home users could tinker around the margins with caseless circuit boards that they had to assemble themselves, but the resulting computer was so basic that its everyday usefulness was slight. Sinclair's own MK14 fell into the latter category. The ZX80 turned the market on its head. Its design, like all of the Sinclair computers, was driven by price and simplicity. Its sub-£100 price point was unheard of at the time, as was the fact that one could simply buy it from a shop, plug it in and use it. Of course, low cost and simplicity meant that severe limitations were imposed on the designers (for instance, using a cheap touch-sensitive keyboard rather than an expensive full-travel keyboard). But there was nothing quite like the ZX80 on the market and its modest success demonstrated the massive potential for a cheap consumer-friendly home computer. It was a formula which Sinclair repeated with great success for all of his later computers. The ZX80's relatively small sales have made it a rare item today, and working second-hand ZX80s are in strong demand. They are particularly hard to find outside of Britain; ZX80s were also exported in small numbers to the United States, but it was not until 1981 that Sinclair entered the US market in earnest (for which see the Timex/Sinclair pages).